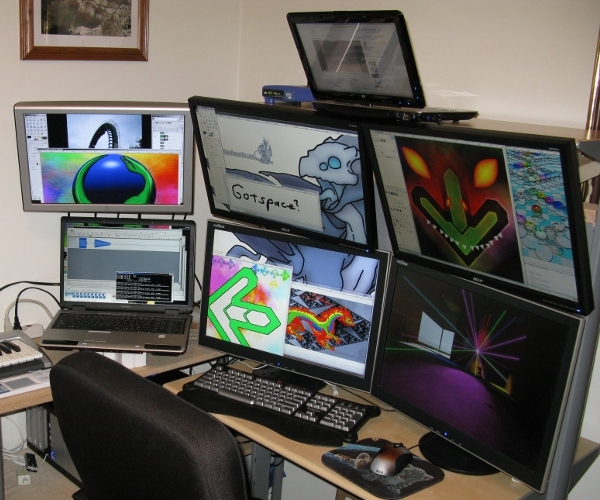 I’m sitting here at my desk and I have five screens within arm’s reach, and I use each and every one of them everyday. Yes, that is kind of excessive – I guess. One is a 40″ HD TV, two are 24″ HD monitors, one is an iPad and one is an Android phone. That’s not counting the two laptops I have in their cases. The monitors are the same size, but frankly that’s just chance: the second 24″ screen was gifted to me – I would have probably bought a 28″ if I was buying one. So yeah, regardless, I have a lot of screens – and I bet many of you do too. The amazing thing to me is this: each of those screens has a useful purpose in my life, and that is pretty remarkable to me, especially as a few years ago, my entire screen existence was a 15″ laptop screen. Period. So this brings up two questions that I’d like to ask. First, what’s up with all these damn screens? Second, are all these different screens a good thing for gadget manufacturers or not? The vast majority of most of my days are spent on my dual 24″ screens (I’m writing this post on one, with Tweetdeck and other desktop apps open on the other). Once and awhile I’ll check something on my iPad or send a text message on my phone (and as someone that often reviews apps, they’re my testing machines too), but it’s mainly my dual monitors throughout the day. Of course, I’ve got the TV as well, which I run an HDMI cable to at night to watch Netflix/Hulu. So that is my usage pattern at home. On the road, I bring my phone, iPad and 15″ laptop around, and here’s the thing when I do – I miss my bigger screens. There, I said it. But you know what, I can’t take them with me, so there is a dilemma, but not one anyone can realistically fix. The real dilemma moving forward, however, is more and different screens. Let me explain. I’ve been itching to get a third monitor for my desktop, but I’m constantly telling myself I don’t need it (yes I do!). If I got one, I’d probably want it to be set up vertically, so that limits my options, but not horribly (I could always just get a third-party stand). Also, I’m thinking of getting a netbook or maybe one of those non-netbook-but-it’s-really-a-netbook 11″ MacBook Airs – but you know what, that’s a new screen size for me. Will I like it? Will it be too small? What about my iPad, do I need two 10″-or-so screens? Then there are all of the Android tablets coming out – which are mostly 7″ by the way. Yet another adjustment. Or perhaps I should just get a 4.3″ Android phone to replace my 3″-whatever screen phone I have now? Should I wait for Retina Display-types of technology to be everywhere? What about e-Ink eReaders? Huh? HUH?! Variety may be the spice of life, but do we really need this many damn screens?! Yeah, we probably do, and that’s the dilemma, not only for us, but for the manufacturers. I don’t think I’ll ever forget Steve Jobs a few weeks ago talking about 7″ Android tablets, and how we’d all have to sand down our fingers to use them. Strange as that rant was, it did get me thinking about how manufacturers like Apple go about this whole screen thing. Really, how the heck would you go about it when people are willing to engage with content on screens from one square inch (the new iPod Nano) to 100″ LCD TVs? Maybe they’ve figured out something that I’m just starting to realize now – size and number of screens doesn’t matter – only attention matters. Perfect case in point: Netflix. No, Netflix doesn’t make a single screen or device, but it does work on just about every conceivable entertaiment platform out there (except for Android, but that’s coming). And you know what? Netflix works on all of them, just about equally well. If you’ve got an iPhone, iPad, laptop, desktop monitor and large screen TV please go ahead and start watching a movie on any of them. Stop the movie after five or ten minutes and then move to the next device, and continue doing so until you’ve used them all. Yes, the TV is going to be best, but it will work and be acceptable on all of the others. Why? Attention, that’s what it all boils down to, not screen size. It’s only when our attention starts to wander (or is in more than one place at a time) that all those different sized screens come in handy.